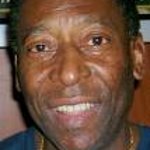 One of the world’s most famous and talented footballers, Pelé led the Brazilian national team to three World Cup victories in 1958, 1962 and 1970. Pelé is an icon in Brazil and around the world, and is a former Brazilian ambassador for sport, as well as currently acting as a FIFA Ambassador against racism. He has worked for children’s causes through UNICEF. He has been a patron of the ABC Trust since 2002 and has donated a number of signed items. We don't have any videos related to Pelé.